(RRP £299.99). 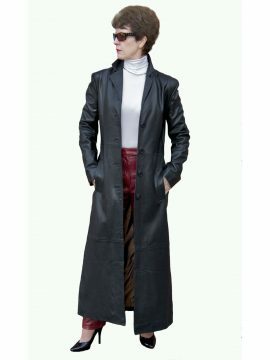 Chic and elegant ladies leather jacket by Sienna de Luca, superbly tailored in luxury quality, supersoft and lightweight lambskin leather as a suit-style blazer jacket. It is single-breasted with a 2-button front fastening, lapels and short back vent and styled to taper in at the waist for a more shapely fit. By Sienna de Luca. Available in dark brown and soft red. NOTE: The jacket in dark brown is a very deep shade of brown (almost black). *** Please Note: Your coat bust size WILL NOT be the same as your bra size – therefore, please measure (with a good tape measure) around the fullest part of the chest. *** Please see our Product Description below for full details and important sizing information. (RRP £239.99). 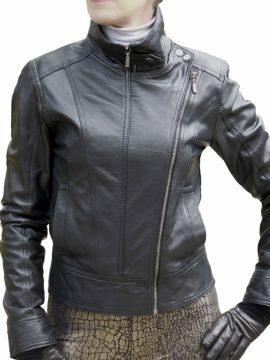 A fantastic high quality ladies black leather jacket that is ideal for casual or smart-casual wear. It is a slim-fitting jacket beautifully tailored in soft lambskin nappa and styled to fit at the waist. It features a double-zip front fastening, a high stand-up collar with stud fasteners and zips also on each sleeve cuff. Made by Ashwood. *** Please Note: Your coat bust size WILL NOT be the same as your bra size – therefore, please measure (with a good tape measure) around the fullest part of the chest. *** Please see our Product Description below for more details and important sizing information. (RRP £369.99). 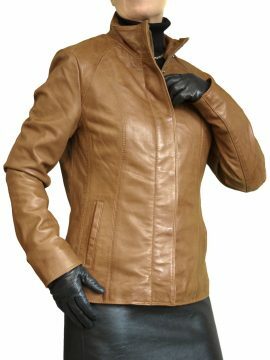 Just gorgeous - a very smart, classy ladies leather jacket for outerwear, made in sumptuously soft lambskin sourced exclusively from the UK. It is a longer length, reaching down to the hips, in a straight cut style, for a more relaxed fit, but subtly shaped in at the back waist. it is single-breasted and has high stand-up collar that can be fastened or folded down as desired. Front zip and extra press-study fastening down front and on collar, hidden under leather panel. Side pockets. Fully lined. By Ashwood. Available in cognac tan and dark navy. *** Please Note: Your coat bust size WILL NOT be the same as your bra size – therefore, please measure (with a good tape measure) around the fullest part of the chest. *** Please see our Product Description below for full details and important sizing information. (RRP £249.99). This classic Marlon Brando-style ladies biker leather jacket is tailored in high quality soft lambskin nappa (a lot of similar style jackets use cowhide leather). NOTE: Styled to be figure-hugging and tight-fitting, including the sleeves. It has a quilted lining for warmth and means it can be worn with only skimpy underclothing (or go up a size). We also a leather mini kilt skirt in matching colours to wear as an outfit (see images). In Black or bright, eye-catching 'pillar box' Red. *** Please Note: Your jacket bust size WILL NOT be the same as your bra size – therefore, please measure (with a good tape measure) around the fullest part of the chest. *** Please see Product Description below for full details and important sizing information.